Workshop at WindEnergy Hamburg 2018 – improving power conversion. 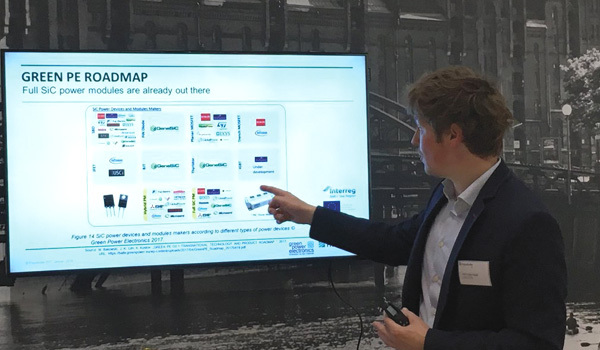 Project partner Renewable Energy Hamburg (EEHH) represented the Green PE project at the WindEnergy Hamburg – the world’s leading expo of onshore and offshore wind industry. In collaboration with Fraunhofer ISIT – Application Center Power Electronics for Renewable Energy System, EEHH organised a workshop with the title ‘Wind energy power quality improvement & supply of ancillary services using advanced control of power converters’. During the presentations of Prof. Dr Holger Kapels, Head of Business Unit Power and Dr.-Ing. Georg Pangalos, Sr. Specialist Control Engineering from Fraunhofer ISIT, the attendees discussed the potentials of power electronic converters and how the quality, robustness and efficiency within power conversion can be improved by wide bandgap SiC-based devices. After the presentations, the attendees had the opportunity to come in direct contact with the experts at individual appointments.